Australia’s capital was once the beige home of politicians, bureaucrats and not much else, but today it boasts more hip hotels than Sydney, restaurants, cafes and bars to rival Melbourne’s best, and some of the greatest galleries and museums in the country. In short, Canberra is now seriously cool. Here’s our guide to 48 hours in the city’s leafy and happening Barton precinct. As you’d expect from an area named after Australia’s first Prime Minister, Sir Edmund Barton, it’s a power player address when it comes to the very best in work, rest and play. Begin your weekend in Canberra with a heart-starter of seriously good coffee coupled with some seriously delicious wholefoods nourishment at Maple + Clove. Enjoy savoury corn waffles and slow cooked egg served with a side of gloriously leafy views of the adjacent Realm Precinct Park at this child-friendly all-day venue. Kick off your Canberra cultural odyssey with a visit the National Portrait Gallery, adjacent to the National Gallery of Australia but specialising in portraiture in all its forms. Engage with famous faces ranging from celebrities to sportspeople in the strikingly contemporary building designed by architectural firm Johnson Pilton Walker. Remember that charming bistro you visited last time you were in Paris? Well, get ready to relive the memory with lunch at Buvette Bistro, an award-winning temple of French cuisine and culture modelled on the classic French bistro. Ease into a long lunch with lemon and shallot vinegar oysters before a steaming bouillabaisse, and perhaps a vacherin glace to end. Waddle down the road to check into Little National Hotel, the chicest new designer bolthole on the Barton block. Hire a bike from the hotel and take a ride around Lake Burley Griffin; the perfect way to work off lunch, and perhaps to spot the odd politician or political journalist pounding the pavements on their afternoon run. A mini-break is all about taking time out, and what better way to indulge than in the luxurious Hale Spa near your digs at the Brassey Hotel? Relax in the Scandi-style lounge with a glass of champagne or herbal tea before your face or body treatment, then surrender yourself to a profound pampering session in one of the nine individual treatment rooms. More champagne? Don’t mind if we do. Enjoy a drink in the lounge of the Little National Hotel, where you can sit by the open fire or page through a book in the spacious library as the sun sets over Parliament House. It’s just a short stroll from your hotel to dinner at Chairman & Yip, a chef-hatted restaurant serving modern twists on Cantonese classics in an elegant and spacious surrounds. Begin your morning ritual with crunchy granola and a silky smoothie at Ritual Coffee in Little National Hotel. This casual café also serves fresh sandwiches and salads and is a popular pit stop with locals as well as visitors. Head to the nearby suburb of Kingston for a fossick through Canberra’s renowned Old Bus Depot Markets filled with everything from fashion and homewares, to vintage collectables, art and craft. Don’t leave Kingston without a visit to the Canberra Glassworks, a glass art studio and gallery where you can watch glass artists ply their extremely hot and skilful craft, or even make a glass piece of your own design. There’s a reason why LiloTang is a beacon for foodies in Canberra- head chef Shunsuke Ota’s 12 hour slow-cooked pork belly and chicken yakitori skewers are simply delicious. In addition to a traditional Robata grill, this Japanese restaurant features manga and animae on the walls and offers convenient Bento lunches in addition to a la carte and a full chef’s tasting menu. Check into to the The 5 Star Hotel Realm, on the footsteps of the Parliamentary triangle. You visit Old Parliament House or Parliament House, which are both on your doorstep, or simply admire the view from your highly minimalist and light-filled modern room. While the National Gallery of Australia is arguably Canberra’s best-know cultural attraction, the National Library also features a gallery that hosts blockbuster shows. Head there to check out another component of the national capital’s creative credentials. 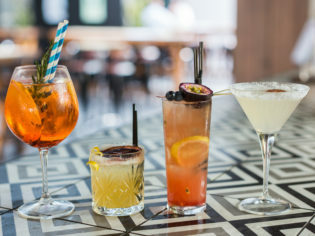 End your stay in Canberra over a oven-fired pizza and tapa-style shared plates in the casual and celebratory environment that is Ostani Lounge, Bar & Restaurant. Central to the many government departments and professional services business of Canberra, the live music the Ostani Lounge is a great people watching post that kicks on well into the night. Wow, this itinerary sounds perfect! Sounds like a perfect, calming and cultural few days! Thanks Josie. Report back when you’ve road tested it.